Eliminating all the negative thoughts that prevent you from achieving happiness and success, The Power of Positive Thinking is an inspiring program that will help you create a positive change in your life. Dr Norman Vincent Peale was born in Bowersville, Ohio and died in Pawling, New York. He was educated at Ohio Wesleyan University and Boston University School of Theology. He graduated from Bellefontaine High School, Bellefontaine, OH. Dr Norman Vincent Peale started a radio program, "The Art of Living," in 1935, which lasted for 54 years. Under sponsorship of the National Council of Churches he moved into television when the new medium arrived. In the meantime he had begun to edit the magazine Guideposts and to write books. His sermons were mailed monthly. During the depression Dr Norman Vincent Peale teamed with James Cash Penney, founder of J.C. Penney & Co.; Arthur Godfrey, the radio and TV personality; and Thomas J. Watson, President and Founder of IBM to form the first board of 40Plus, an organization that helps unemployed managers and executives. In 1945, Dr. Peale, his wife, Ruth Stafford Peale, and Raymond Thornburg, a Pawling, New York businessman founded Guideposts magazine, a non-denominational forum for celebrities and ordinary people to relate inspirational stories. For its launch, they raised ,200 from Frank Gannett, founder of the Gannett newspaper chain, J. Howard Pew, a Philadelphia industrialist and Branch Rickey, General Manager of the Brooklyn Dodgers. 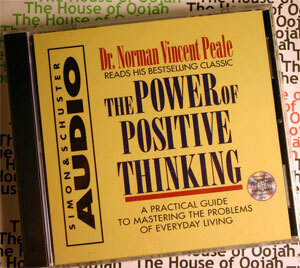 Dr Norman Vincent Peale was a prolific writer; The Power of Positive Thinking is by far his most widely read work. First published in 1952, it stayed on the New York Times bestseller list for 186 consecutive weeks, and according to the publisher, Simon and Schuster, the book has sold around 7 million copies. Some of his other popular works include The Art of Living, A Guide to Confident Living, The Tough-Minded Optimist, and Inspiring Messages for Daily Living. In 1947 Dr Norman Vincent Peale co-founded (along with educator Kenneth Beebe) The Horatio Alger Association. This organization aims to recognize and honor Americans who have been successful in spite of difficult circumstances they have faced. In 1960 Dr Norman Vincent Peale, as spokesman for 150 Protestant clergymen, opposed the election of John F. Kennedy as president. "Faced with the election of a Catholic," Dr Norman Vincent Peale declared, "our culture is at stake. (The Religious Issue: Hot and Getting Hotter. Newsweek. Sept 19, 1960.) In a written manifesto Dr Norman Vincent Peale and his group also declared JFK would serve the interests of the Catholic church before the interests of the United States: "It is inconceivable that Roman Catholic president would not be under extreme pressure by the hierarchy of his church to accede to its policies with respect to foreign interests," and that the election of a Catholic might even end free speech in America. (The Religious Issue: Hot and Getting Hotter: Newsweek, Sept. 19, 1960. Buckley, William F. "We Hold These Truths." National Review. Jan. 28, 1961). Protestant theologian Reinhold Neibuhr responded "Dr. Peale and his associates... show blind prejudice." (The Religious Issue: Getting Hotter and Hotter: Newsweek. Sept 19, 1960). Protestant Episcopal Bishop James Pike echoed Neibuhr: "Any argument which would rule out a Roman Catholic just because he is Roman Catholic is both bigotry and a violation of the constitutional guarantee of no religious test for public office." ("The Power Of Negative Thinking." Time. Sept. 19, 1960). The Dr Norman Vincent Peale statement was further condemned by President Truman, the Board of Rabbis, and other leading Protestants such as Paul Tillich and John C. Bennett. (Ibid.) Dr Norman Vincent Peale was forced to recant his statements and subsequently fired by his own committee. As conservative William F. Buckley succinctly described the fallout: "When... The Norman Vincent Peale Committee was organized, on the program that a vote for Kennedy was a vote to repeal the First Amendment to the Constitution, the Jesuits fired their Big Bertha, and Dr. Peale fled from the field, mortally wounded." (National Review. "We Hold These Truths." January 28, 1961). Dr Norman Vincent Peale subsequently went into hiding and threatened to resign from his church. (New York Times. "Beliefs." Oct. 31, 1992). The fallout continued as Dr Norman Vincent Peale was condemned in a statement by one hundred religious leaders and dropped as a syndicated columnist by a dozen newspapers. (Ibid). The uproar caused the pastor to back off from further formal partisan commitments, possibly to avoid offending part of the mass audience for his primary religio-psychological message. He was, however, politically and personally close to President Nixon's family. In 1968 he officiated at the wedding of Julie Nixon and David Eisenhower. He continued calling at the White House throughout the Watergate crisis, saying "Christ didn't shy away from people in trouble. Dr Norman Vincent Peale is also best remembered in politics by the famous Adlai Stevenson quote: "I find Paul appealing and Peale appalling." The origin of the quote can be traced to the 1952 election, when Stevenson was informed by a reporter that Dr Norman Vincent Peale had been attacking him as unfit for the presidency because he was divorced. (Former Senate candidate Ed Garvey in his blog fightingbob.com). Later during the 1956 campaign for President against Eisenhower, Stevenson was somewhat rudely introduced in the following way: "Gov. Stevenson, we want to make it clear you are here as a courtesy because Dr. Norman Vincent Peale has instructed us to vote for your opponent." Stevenson stepped to the podium and quipped, "Speaking as a Christian, I find the Apostle Paul appealing and the Apostle Peale appalling." In 1960 Stevenson was asked by a reporter for a comment regarding Dr Norman Vincent Peale attacking JFK as unfit for the presidency because he was Catholic, to which Stevenson responded: "Yes, you can say that I find Paul appealing and Peale appalling." (Political commentator Tom Roeser tomroeser.com). Stevenson continued to lampoon Dr Norman Vincent Peale on the campaign trail in speeches for JFK. Though Nixon and the Republicans tried to distance themselves from the furor caused by Dr Norman Vincent Peale's anti-Catholic stance, Democrats did not let voters forget. President Truman, for one, accused Nixon of tacit approval of the anti-Catholic sentiment, and it remained a hot issue on the campaign trail. (The Religious Issue: Hot and Getting Hotter: Newsweek. Sept. 19, 1960). Regarding Dr Norman Vincent Peale's intrusion into Republican politics, Stevenson said in this transcript of a speech given in San Francisco: "Richard Nixon has tried to step aside in favor of Norman Vincent Peale (APPLAUSE, LAUGHTER)... We can only surmise that Mr. Nixon has been reading 'The Power of Positive Thinking.' (APPLAUSE). America was not built by wishful thinking. It was built by realists, and it will not be saved by guess work and self-deception. It will only saved by hard work and facing the facts." At a later date, according to one report, Stevenson and Peale met, and Stevenson apologized to Peale for any personal pain his comments might have caused Peale, though he never publicly recanted the substance of his statements. There is no record of Peale apologizing to Stevenson for his attacks on Stevenson. It has been argued that even his "positive thinking" message was by implication politically conservative: "The underlying assumption of Peale's teaching was that nearly all basic problems were personal." For his contributions to the field of theology, President Ronald Reagan awarded Peale the Presidential Medal of Freedom (the highest civilian honor in the United States) on March 26, 1984. He died of stroke on December 24, 1993 at age 95.
completely new way of thinking that makes heightened achievement levels and personal transformation possible.